Long Term Care Insurance can protect your assets from the high cost of needing Long Term Care services such as Home Health Care, Assisted Living and Nursing Homes. With the average cost in Ohio of $87,000 per year for a Nursing Home, it would not take many years to spend a large sum or all your assets on care. 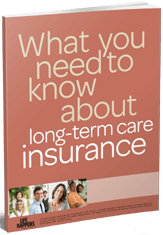 Get Long Term Care Insurance Ohio quotes and comparisons of the top-rated carriers to find the best company at the best price. Your Ohio Long Term Care Specialist will help guide you through your options and answer any questions you have. Representing major long term care insurance companies like Genworth Financial, John Hancock, The State Life, Transamerica, Lincoln MoneyGuard, MassMutual, MedAmerica and Mutual of Omaha. Our long term care insurance specialists serve the cities of Columbus, Cleveland, Cincinnati, Toledo, Akron, Dayton, Parma, Canton, Youngstown, Lorain, Hamilton, Springfield and all cities in the State of Ohio.